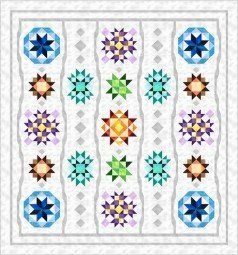 Festival of Stars quilt Kit includes patterns and fabric to complete the top, including borders and binding. Price includes Shipping. Designed by: Sue Harvey & Sandy Boobar of Pine Tree Country Quilts Quilt size: 78" x 83 1/2"